This was made for a friend’s granddaughter for her 4th birthday. I had an absolute blast with this cake! It was a little challenging but so worth it. I made a cream cheese icing with food coloring added. The cakes are chocolate and marble layers. The towers are regular colored ice cream cones and sugar cones. The regular cones are frosted and the sugar cones are iced and rolled in sprinkles. I recommend freezing the coated sugar cones until the day of the occasion if possible. They just look better and are easy to work with! 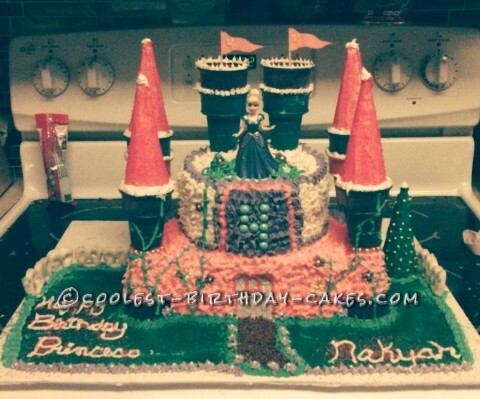 Everything is edible with the exception of the princess and flags. I used cake pop sticks in the middle for support. They worked well and they are easy to cut or break off to fit the cake. I left 2 long sticks on the back of the top cake to put the cones on and provide stability. This cake took a couple days to make including baking time. I suggest getting it all done the day before the occasion in case something goes wrong. It will not hurt the cake or taste.